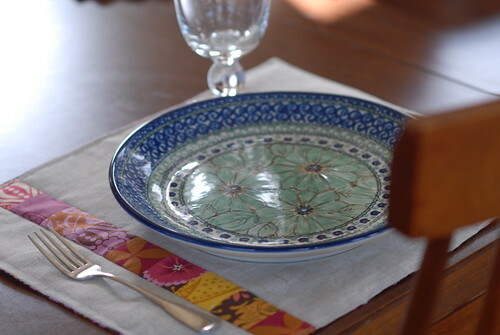 Lately I’ve been tempted by beautiful placemats. Tempted? Yes. 1. I have enough projects going right now. 2. We don’t need placemats. More on that later. Don’t you want to see the objects of my temptation? 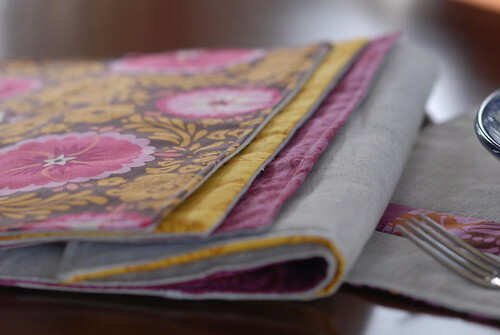 Anna Maria Horner fabric + Patchwork + linen = Perfection. Lucky swap partner! It’s made by Bloomin’ Workshop. Her “mini quilt” placemat makes me want to test out quilt designs on a small scale like this. Hardly takes any fabric and definitely takes less time than a quilt. I’ve been hankering to try quilted hexagons, which are reported to be incredibly labor intensive, but as a placemat not so much. Tempting. However, I do declare that there are no placemats forthcoming! You see, placemats don’t work for us. They’d be dirty at every meal (those messy kids, never me! ;)). I’ve heard that you just shake them over the garbage and put them back on the table (maybe any spills would be hidden in the patchwork? 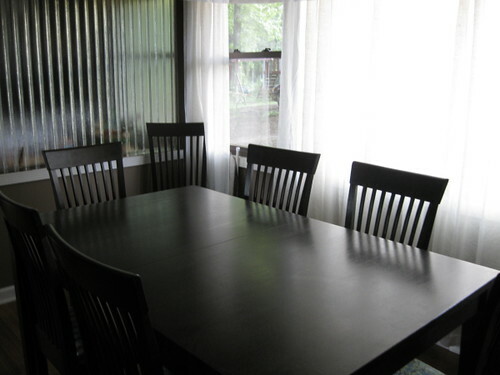 ), but that sounds like more work to me than simply wiping down our bare table. Plus, I sew at that table. It’s already enough to haul out the sewing machine, iron, ironing table, cutting mat and supplies every time I want to sew. So, plain is my table and plain it will remain. Nevertheless, time spent gazing at beautiful placemats instead of quilting my Meadowsweet baby quilt is not in vain. I think that Three Dancing Magpie’s minimalist patchwork row on linen would be a lovely outer for a make up roll, don’t you think? And, the mini quilt concept with or without hexagons would work well for a pot holder, which we do need. And, that’s what I love about browsing other’s work on Flickr. Inspiration comes in handy and sewing is SO versatile. Thanks to all the artists on Flickr! P.S. 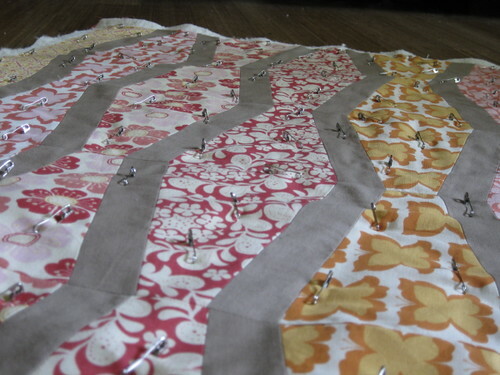 Poor, patient Meadowsweet quilt. I will stitch you tomorrow!